The Cold saw blades achieves extended blade life at solid cutting by combining the performance advantages of Cermet with the latest PVD coating technology. Feed 0,04 - 0,2 Mm/Tooth. Champion Saw Blade is part of a new generation of saw blades - for extremely high output and very long blade life. This product has been developed to cut thin walled tubes with tensile strengths up to 1,800 N/mm2. Suggested Cutting Speed 180 - 280 M/Min. Feed 0,04 - 0,16 Mm/Tooth. 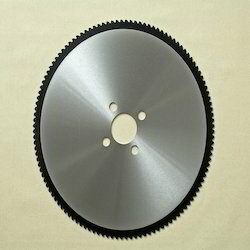 The Connexxioncut Three Saw Blade has been developed for cutting tubes on high performance automatic sawing machines, at a higher maximum cutting speed than with HSS saw blades. It is most effective on sawing machines with accurate control of chip load and variable feed rate. Suggested Cutting Speed 80 - 140 M/Min. Feed 0,06 - 0,12 Mm/Tooth. The high nickel content of austenitic stainless steel tubes makes them difficult to cut with HSS saw blades. With the dedicated tooth geometry of the carbide tipped and PVD coated Connexxioncut 4 saw blade, perfect surface finish and burr-free tube ends will be achieved. Suggested Cutting Speed 160 - 280 m/min. Feed 0,025 - 0,12 mm/tooth. Connexxioncut Saw Blade has been specifically designed to cut thin walled tubes. Because of its light cutting properties it is also very well suited for use on a wide range of automatic cut-off machines. Suggested Cutting Speed 80 - 120 M/Min. 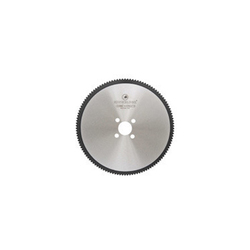 Connexxioncut Six Saw Blades are carbide tipped and PVD coated for cutting solid stainless steel. With their proprietary geometry very fast cutting and good surface finish can be achieved. Suggested Cutting Speed 80-140 m/min. Feed Up to 0,10 mm/tooth. 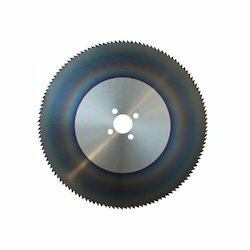 Connexxioncut Saw Blade is a Cermet tipped saw blade dedicated to cut low to medium strength carbon steel. On many applications, blade life of 50 m2 and more can be achieved. Suggested Cutting Speed 100 - 280 M/Min. Feed 0,04 - 0,11 Mm/Tooth. The Champion SL Saw Blade achieves extended blade life at solid cutting by combining the performance advantages of Cermet with the latest PVD coating technology. Suggested Cutting Speed 120 - 240 M/Min. Feed 0,04 - 0,10 Mm/Tooth. 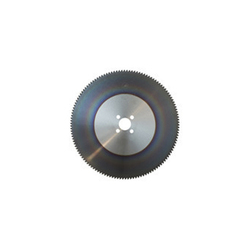 This PVD coated carbide tipped saw blade has been developed for cutting solid steel with tensile strengths between 800 - 1,600 N/mm2 at very high production rates. Suggested Cutting Speed 350 - 400 m/min. Key features of the Tube Master Saw Blades are fracture-resistant carbide tips, protected with a high-tech TiAlN-based PVD coating. Combined with a light cutting geometry, which eases chip removal, a milled like surface finish is assured. This geometry also reduces vibration when cutting thin wall tubing (<4mm), thereby achieving excellent blade life. Tube Master saw blades are available in diameters from Ø 300 up to Ø420 mm for all types of orbital cutting machines, such as MTM, OTO mills, Elmaksan, Kusakabe, Linsinger and SMS Meer. Suggested Cutting Speed 450 m/min. Scarf Master Saw Blade is a PVD coated carbide tipped saw blade featuring a very specific tooth-geometry while tips themselves are made of a highly shock resistant type of carbide. The teeth are supported by a saw body with extra strong shoulders, which give the combination tooth/body very high stability and fracture resistance and therefore extended blade life. Flying cut-off application dealing with heavy ID Scarf ScarfMaster saw blades are available in diameters from Ø 450 up to Ø600 mm for flying cut-off machines, such as MTM, OTO mills, Nakata and Olimpia. Material Tubes with a tensile strength up to 1800 N/mm2. 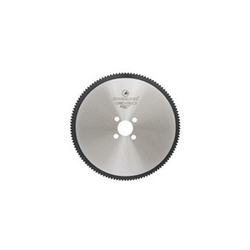 Speed Master Saw Blade is a TCT saw blade for flying cut-off applications on tube mills. It provides an opportunity to greatly increase the tube manufacturing line speeds and cut the production costs. Where cutting speed limits of coated HSS saw blades have been reached, SpeedMaster saw blades provide an effective solution. 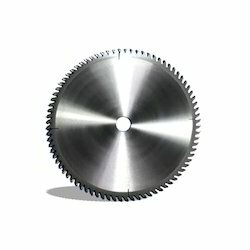 Looking for Cold Saw Blades ?